Having spent six months at Church Broughton Derbyshire at 27 Operational training Unit Wally signed up for a second tour and was posted to 1661 Conversion Unit at Winthorpe and 5 Group Lancaster Finishing School at Syerston where he crewed up with six Australians. With 463 Squadron based at Waddington these seven men formed a partnership which was to carry all of them through 20 more operations from July 1944 to February 1945. 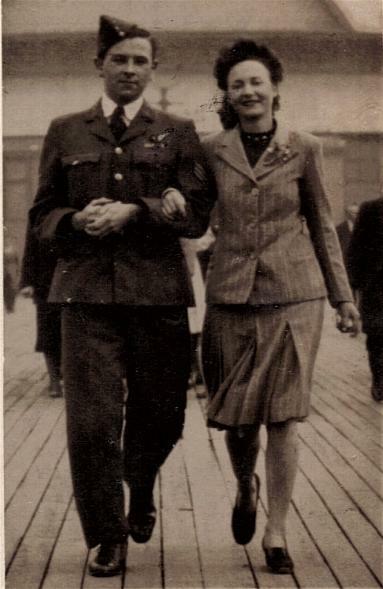 In August 1944 Wally gained his commission and was promoted to Flying Officer. 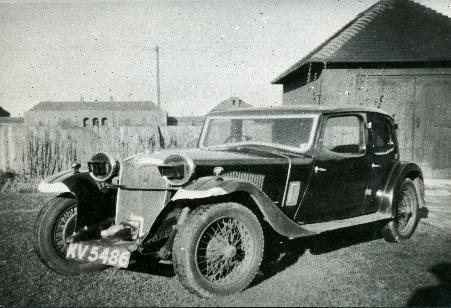 This car was sold to Bill Radford at the end of the tour. On the night of July 24th 1944 Wally and the six Austrailians who made up the rest of the crew set off for a night raid on Stuttgart, the first sortie of Wally's second tour. Fifteen of these operations were night raids, the remaining five were the only daylight raids Wally carried out during both tours. On this second tour the crew had a very narrow escape during a raid on Koenigsberg on the night of August 29th 1944. 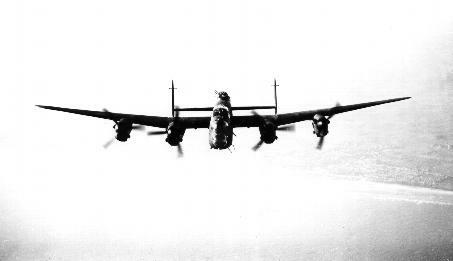 The Lancaster they were flying LM242 JO-Y came under attack from a Junkers 88. Fortunately thanks to some expert flying by Bill Radford they were able to escape serious damage and return to Waddington having successfully bombed the target!Below is a combat report from the Luftwaffe. 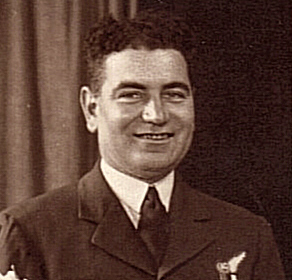 During the raid on Konigsberg that night P/O R H Beddoe joined the crew as second pilot having only been posted to the squadron the previous day. Two nights latter P/O Beddoe was killed along with the rest of his crew on a training flight over the highlands of Scotland in Lancaster PD259 JO-G.
After the raid on Koenigsberg the crew never flew LM242 again as she was shot down over Frankfurt on 12th September. Because of this loss Wally's crew took possession of a new Lancaster PD330 which became the new JO-F. PD330 carried the crew safely through the remaining 11 operations of the tour. 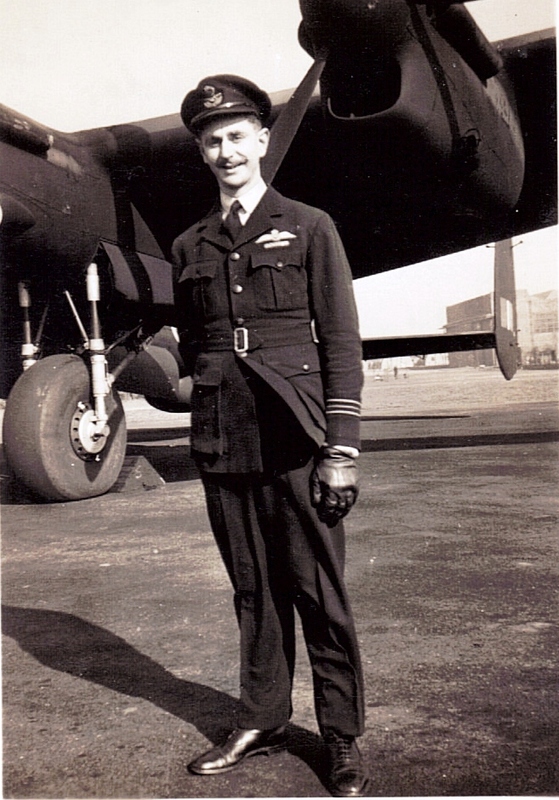 One of those raids was the longest in time that Wally flew on during his career with Bomber Command, a 10 hour 15 minute raid on Politz during January 1945. His previous visit to Politz some three weeks earlier was also memorable in the fact that in his 51 ops' this was the only time Waly failed to return to base. On returning from this riad on the morning of 22nd December 1943 the fog was so heavy over cerntral England that trhe crew was ordered to land at Lossiemouth. They were able to take the 2 hr.15 min. journey back to Waddington the following day, and get home for Christmas! On the evening of 7th February 1945 Wally set out on his last sortie of his second tour, a raid on the Dortmund Ems Canal. Six hours and 10 minutes later he landed back at Waddington his last raid completed. 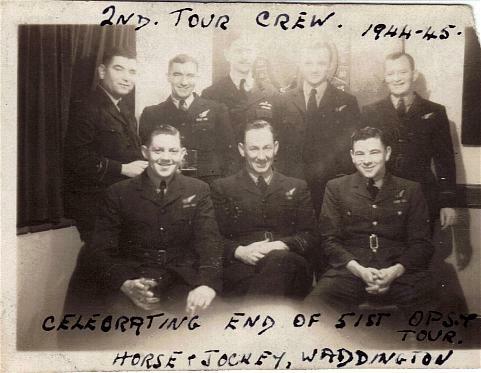 Wally and his second tour crew (all Austrailians) on completion of their second tour.The crew at this time had a combined sortie total exceeding 320! The eigth member of crew is FL. A C Winston who flew as ventral gunner on three operations. 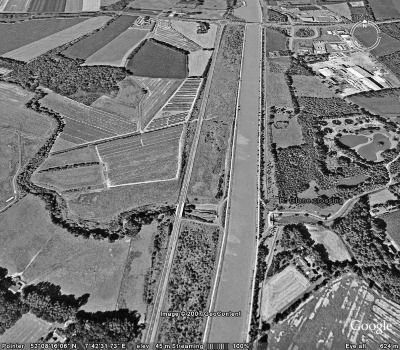 A view of The Dortmunds Ems Canal a welcome sight for Wally's 51st and last sortie. So just three weeks short of his 25th birthday Wally had completed 51 raids over occupied territory amounting to over 300 operational flying hours!